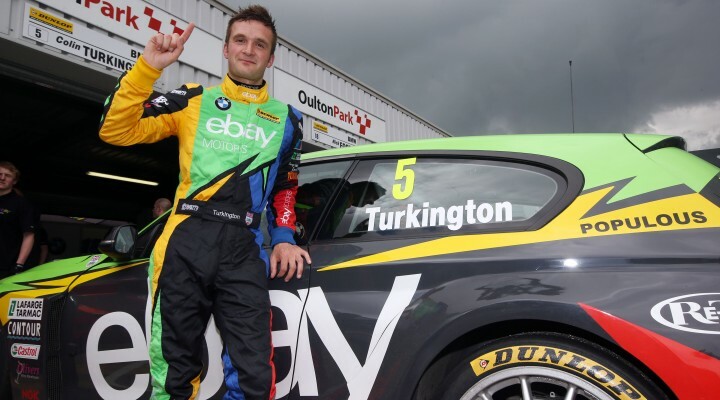 Colin Turkington will start round ten of the Dunlop MSA British Touring Championship from pole position after coming out on top of a late qualifying showdown at Oulton Park. Jason Plato will start alongside the BMW having led the times for much of the session, whilst Honda Yuasa Racing’s Gordon Shedden took third after his own flying lap in the closing stages. A number of drivers seemed set to improve on their final tour but any last gasp drama was scuppered when Jack Clarke’s Crabbie’s Racing Ford Focus hit the barrier at Druids, bringing an end to the session with a red flag in the final minute. The fight for pole in drying conditions had already been squeezed into the final ten minutes after Adam Morgan’s Mercedes caused the first red flag of the session when he went off at the same corner. The circuit improved slightly during the time taken to retrieve his stricken car, and the delay meant the times recorded in the first 20 minutes were almost redundant. Plato improved on his own benchmark several times during the session with his MG6 proving to be perfectly balanced in the mixed conditions. He may have been one of the drivers who could have improved again prior to the premature end to the running, but it wasn’t to be as Turkington clocked his time shortly before Clarke’s accident. Shedden rescued what seemed to be a frustrating day for the Honda drivers with third, while both reigning champion Andrew Jordan and manufacturer driver Matt Neal were left languishing down the order in 13th and 14th respectively. Jordan’s result is the first time the 25-year-old has qualified outside the top ten since Silverstone in 2012, whilst Neal’s best lap time was removed for a track limits infringement leaving him further back than he would otherwise have been. Rob Collard completed a good day for the eBay Motors squad and for him personally by setting the fourth fastest time ahead of MG KX Clubcard Fuel Save driver Sam Tordoff, cementing the pace-setting form for both BMW and MG so far. Exocet Racing’s Rob Austin scored his best qualifying result of the season with sixth, backing up the promise he had earlier shown in free practice, whilst Mat Jackson was the top Ford performer in seventh. His Airwaves Racing team-mate Fabrizio Giovanardi had run as high as fifth in the mid-stages of the session but he eventually faded to finish 12th. Quantel Bifold Racing’s Marc Hynes had shown good speed throughout the day around the 2.77 mile Oulton Park International Circuit. He turned that speed into his highest ever BTCC qualifying position with eighth on a layout which hasn’t been used by the series since 1996. Incredibly Hynes also raced at that event 18 years ago as a young and upcoming single-seater racer in the supporting Formula Vauxhall Junior category. Tom Ingram continued his impressive qualifying form in his maiden BTCC season with ninth in the Speedworks Motorsport Toyota Avensis, pipping the final eBay Motors BMW of Nick Foster. Aron Smith’s VW was next on the timesheets ahead of a quartet of former champions – Giovanardi, Jordan, Neal and Alain Menu, the latter of which was one of the drivers to have had his final effort thwarted by the red flag. The only consolation for the Swiss driver is that his 20 year old qualifying lap record stands as the drivers were unable to dip below his time due to the conditions. With the grid perfectly poised and championship leader Jordan down in a disappointing 13th, tomorrow’s triple header in front of an expected huge crowd looks set to be a pivotal day in the fight for the 2014 Dunlop MSA British Touring Car Championship. Colin Turkington said: “As soon we went out for the last stint the rain started to fall and I didn’t think we’d be able to do it. Luckily it was only a few drops and the tyre performance came in really quickly. I just got the lap in – the guys in the team have done a fantastic job so I’m delighted. Click here for the classification from qualifying at Oulton Park.